Last night I received a scavenger hunt list on Photoswap, so we thought, since we had a few friends over, thought that we'd have a little fun and participate. We contributed a few items to the list to the left and learned how the game worked on Photoswap. As a daily bus rider in the Puget Sound area, I was hoping that there was some sort of iPhone app that would allow me to track the location of my bus. Every morning I use King County Metro's Tracker, which is a Java applet on their website which would be useless in Mobile Safari. The idea here is you take a photo with your iPhone's camera and upload it to a central server that will, in turn, hand you back someone else's random photo that they just took and uploaded only moments ago as well. And what to do you get for your photo? Well, that's the mystery and the attraction of Photoswap for many. I have updated the silly game I wrote a while back called "Pokemon or Pill". When my son was collecting Pokemon cards, I noticed that the names sounded a lot like the weird names given to prescription drugs. So I created a quiz that you can take to see if you can tell which is which. $2 trillion later or $20 billion now? Yeterday I stumbled across a somewhat disturbing article about the significant impacts that solar flares on our infrastructure. In the recent and not so recent past our fragile magnetosphere has been hammered by dozens of powerful solar flares. In 1989 a solar flare knocked out power to 6 million people in Canada for 9 hours. In 1859 an event set numerous telegraph stations on fire. It is the 1859 event that is of most concern as it was the most powerful solar flare in recorded history. My ancient Razr V3 was finally starting to give up the ghost. After we returned from Antigua, it was never quite the same, but for many months the SIM card would become lose and cause it to stop working. But now, the #2 key stopped working intermittently. The current economic situation has made the most obvious and attractive replacement, the iPhone, a non-option, so I had to find the best "free" AT&T mobile to replace the Razr. I've been using a Canon Powershot G2 as a 'point and shoot' camera for almost as long as I can remember. Before I purchased a DSLR, a G2 was my main camera, and even after I had a DSLR, a G2 was my smaller 'carry-around' camera. It was bulky and only 4.1 megapixels, but it took amazing pictures. I decided that I wanted a new point and shoot camera, one like the Canon ELPH cameras that would fit in my pocket when I didn't want to carry around my whole DSLR kit. 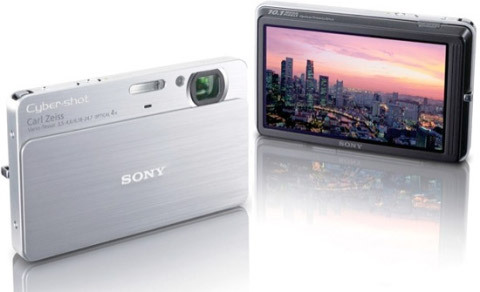 I finally settled on the Sony Cyber-shot DSC-T700. Here is my review. There's a fascinating article at Vanity Fair Magazine about the mid-air collision of a GOL Airlines Boeing 737 and N600XL, an Embraer business jet. I have acquired nearly all the pieces I need to begin work on my All Sky Camera project. I have purchased the camera (Panasonic WV-NP244 IP CCTV camera), the lens (Fujinon 2.8mm-8mm) and the rotating telescope base. The telescope base will be made from a Meade ETX-60RA telescope that I acquired on craigslist. That means all I have left to purchase is the convex sky reflector... More to come..